I bought a book, Christmas Traditions in Stained Glass by Brenda Henning, that features the most wonderful Christmas items done in a stained glass look. 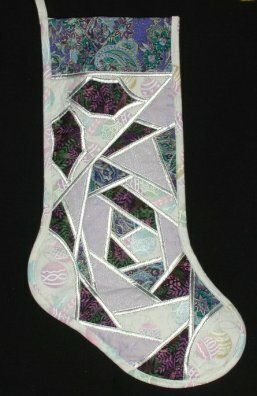 The Christmas stockings were particularly nice so I decided I would make one for each of my girls. The prints used weren't necessarily Christmas-themed prints. The blue and red stockings were but the lavendar wasn't. The actual constuction technique is so easy and fast but looks very complicated. The "WOW!" factor is pretty high on these items! The "leading" lines are 1/4" (finished) bias strips. 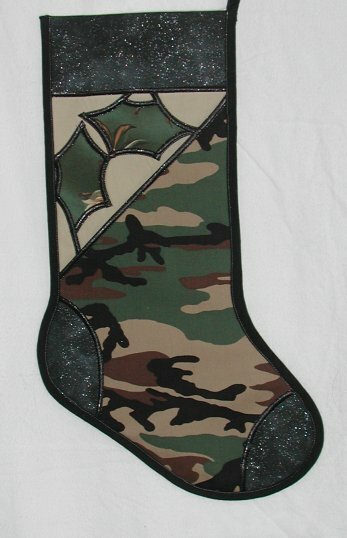 To put the glitz on the stocking, I wanted metallic gold and silver bias. I splurged and bought the Clover Quick Bias Tape. It has an iron-adhesive on the back and is absolutely *terrific*. A true 1/4" wide. The reason why it might be considered splurging is because it's rather expensive. However, on the other hand (the one without the warts), it definately saved me oodles of time and hours of frustration. I absolutely DETEST sewing on lamé. I know how to make yards and yards of continuous bias tape and have no problem doing so, *if* it's not lamé. So, the trade-off between my time/frustration and money spent was a good one for me. 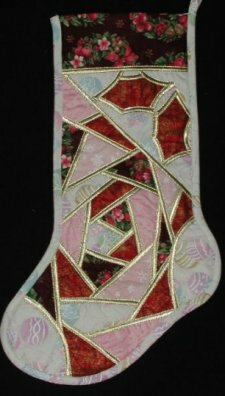 I was keeping track of my time when I was making the stockings and determined that it took about 3-1/2 hours per stocking, from cutting of the fabric to the final stitching. I topstitched each side of the bias down .. that's why it took me 3.5 hours .. you have to travel each bias tape line twice. Not particularly difficult but definately time-intensive. It was after I completed the stocking that I disovered that the 4mm twin needle will accurately stitch down both sides of the 1/4" bias tape simultaneously, thereby effectively cutting your topstitching time in half. The tricky part with the twin needle is turning/pivoting corners .. as in you can't pivot. You need to raise the presser foot, turn your fabric in place and lower the needles back down so the stitching is continuous. Again, a little practice and it's not so tough. Then, my girls were wondering (and Mr. Pirate after that) why I hadn't made stockings for Mr. Pirate and myself (well.. to be truthful, I know it's gonna be me who fills the extra two stockings and with everything else that goes on in December, I really, really don't want any additional work to do). 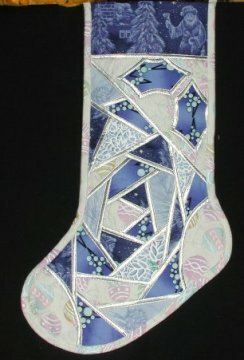 However, there is a second version of the stocking available ... one that features a main print as the body of the stocking .. no sections to speak of. So I chose the less involved pattern of the two offered ... cuz 1) it was less complicated and 2) it would set the girls' stockings off better if ours were different. One other difference is that on our two stockings, I used a machine blind-hem stitch to sew the bias strips down, instead of top-stitching. 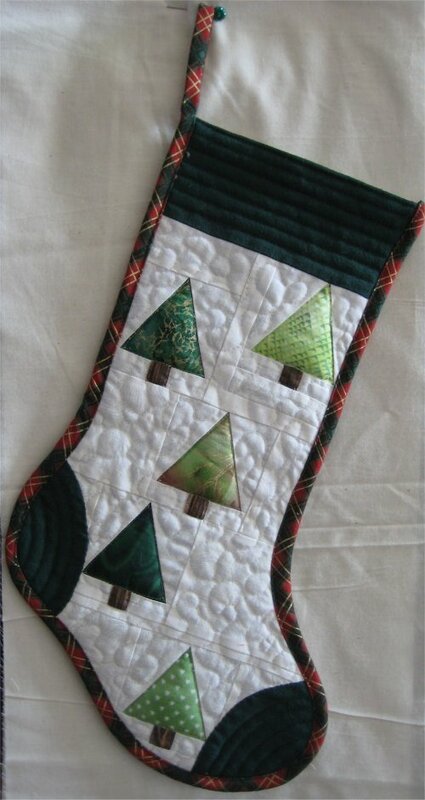 It gives a slightly different look to the finished stocking. 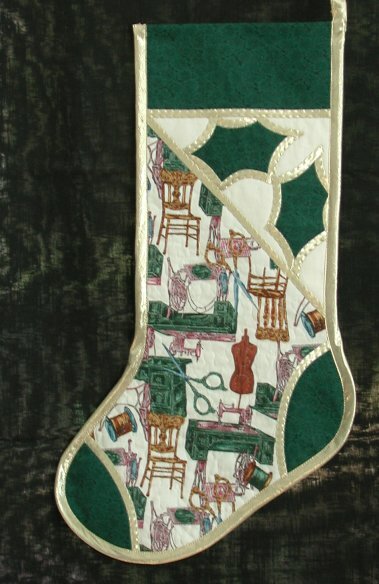 The featured fabric for my own stocking was part of my sewing-theme stash. I was somewhat at a loss for what to use in Mr. Pirate's stocking, so I asked him before choosing. Much to my surprise (though why I should be surprised at anything he comes up with at this late date in our marriage is quite beyond me! ), he asked for green camo. Hey.. no problem! Green camo it is! Now, it just goes to show you how cocky and overconfident one can get .... I was sorta watching TV and sewing the stockings at the same time, i.e. not paying too much attention to the stockings. I mean, c'mon .. I've made 3 of them fairly recently right? What could go wrong? ::ahem:: Famous last words. Let's fast forward to September 2011. Our oldest Dear Daughter has married Forrest. Now that Forrest is a member of our family, he needs to have a Christmas stocking also! If you'd like to read the entire, gory creation saga of Forrest's Christmas stocking, it has its own webpage.